Physiotherapy news and articles to learn about your injuries and the wellbeing of your body. Discussions about wellness, sports injuries, new physiotherapy breakthroughs and more. The wrist provides the penultimate link in the kinetic chain of the golf swing. The professional game of golf has become increasingly focused on the bodies ability to generate power and club head speed to gain an advantage. During the swing the lead side of the body is the predominate generator of this power. It is no wonder then that the lead wrist is the second most common site of injury in professional golfers (behind the lumbar spine) with an incidence as high as 30%. In this population they are commonly injured by either overuse or impact related mechanisms and occur more frequently in younger golfers with lower handicaps. This is in comparison to low back injuries which are more frequent in older players with higher handicaps. The lead wrist is where the majority of injuries occur (29-67% of all problems) and the site of injury will mostly be ulnar sided. Worth pointing out is that in amateur, non-professional, golfers the lead elbow is the second most common injury. The causes for wrist injuries in amateurs will be a bit different to those mentioned below. Most wrist studies have been done on professional golfers and ones in amateurs are awaited. During the swing the lead wrist will begin in an ulna-deviated position and move into maximal radial deviation at the top of the back swing. As the swing commences the wrist rapidly moved back into ulna-deviation by impact. One explanation for why a lower-handicapped golfer will experience lead wrist pain more commonly is through the process of "playing through the ball" (Hawkes et al, 2013). The trail wrist follows a completely different motion, beginning in neutral and moving into maximal extension at the top of the back swing and returning to neutral at impact. Understanding the different wrist movements can help understand injury patterns in golfers and the mechanisms that can help manage them. Grip - strong (closed) vs neutral vs weak (open). A good swing will start with a good grip so it is best to discuss your grip technique with you golf coach as different grips will serve different purposes. A rule of thumb (pun intended!) is that a weaker grip will result in more injuries to the wrist due to the excessive motion that is associated with it. What SWING FAULTS cause the wrist to be the site of injury? 1st CMC degeneration and radial tendon injuries can arise from having a long thumb position (along the club) combined with a weak grip. This can place increased tension on the EPL and APB tendons resulting in De Quervains or Intersection syndromes and/or increased joint stress. Seeking an opinion from a Sports Physiotherapist or Sports Physician is a good first place to start. These specialists can assess the anatomy and movements of your wrist to determine what is causing the pain. MRI, xray and ultrasound imaging may be requested to determine the extent of injury that has occurred and to confirm a diagnosis. Once the problem has been identified physiotherapy management may address joint and soft tissue mobility issues with some manual treatment (soft tissues releases and joint mobilisation) and taping (to limit unwanted movements). This is followed by prescribing an appropriate strengthening exercise program that can improve grip and general upper limb strength. Exercises can be varied (and should be specific to the injury) but the following youtube link demonstrates some simple strengthening exercises using resistance bands and a golf club for weight are a good place to start. Several training aides exist that can be useful to help manage wrist related injuries. It is important to note that these aides should be used under guidance from your physio, doctor or golf coach as incorrect or excessive use can cause further damage and injury. 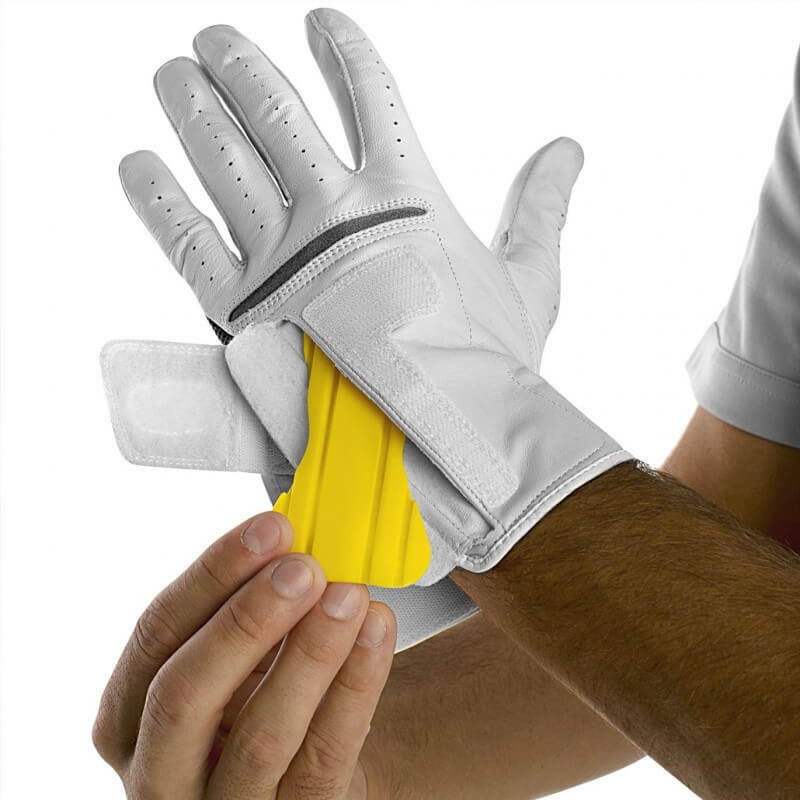 A dorsal blocking splint can be used during training to prevent excessive wrist extension (such as SKLZ Smart Glove). A wrist widget is a very useful and effective splint that can alleviate ulna sided wrist pain due to excessive ulnar deviation or TFCC injury. These can be worn whilst playing and are generally used until symptoms have resolved. A swing correction tool can be used to help set the correct hinge position at the top of the back swing. While not useful during a round of golf, it can be incorporated into range sessions to gain a feel for where excessive unwanted movement occurs during the swing. This then can train and prevent certain movement patterns at the wrist that result in injury. Wrist injuries can be serious and are devastating to a golfer and their game. As most of these injuries are overuse in nature prevention is the best cure. If you begin to feel symptoms of pain, swelling or weakness get it assessed early and you will limit your time spent off the course. Hawkes R, O'Connor P, Campbell D. The prevalence, variety and impact of wrist problems in elite professional golfers on the European Tour. BJSM 2013;47:1075-1079. Campbell D, Campbell R, O'Connor P, et al. Sports-related extensor carpi ulnaris pathology: a review of functional anatomy, sports injury and management. BJSM 2013;47:1105-1111. O'Connor PJ, Campbell R, Bharath AK, et al. Pictorial review of wrist injuries in the elite golfer. BJSM Sep 2016, 50 (17) 1053-1063. Have you heard of this relatively new treatment technique commonly called "flossing"? The rise in popularity of floss bands (or compression band therapy, CBT) can be largely due to interest from the Cross Fit world where it is a popular mobility tool for athletes pre competition and training. The idea and frequency of use in a clinical physiotherapy setting post injury or surgery is limited with a lack of good clinical trials currently available. Potentially, common injuries such as sprained ankles, torn muscles and post-operative surgery stiffness can benefit from such techniques. The primary theory of CBT is credited to fascial shearing or re-perfusion of blood to muscle (though as mentioned above the latter is less likely). The role of fascia is varied and can act to restrain motion, as a connective structure for skin or provide lubrication or gliding movement (Guimberteau, Delage, McGrouther, & Wong, 2010). The same group of researchers looked at fascial sliding in the hand during surgery with a visual description seen in Figure 2. Perceivably, with peripheral joints lacking bulky overlying tissue, this sliding of the superficial fascia is possible with CBT but yet to be researched. Another purported mechanism has suggested some psychological benefits following application of CBT to the shoulder (Kiefer et al., 2017). At this stage any conclusions are merely anecdotal. Application of CBT/floss bands can potentially be a useful adjunct to current treatment techniques for acute joint sprain stiffness and restoring ROM. In my experience there seems to be a consistent effectiveness with ankle and knee ROM in the short term. Further review for the effectiveness with knee ROM post-surgery is warranted due to the increased presence of knee stiffness that is often seen. More studies are still needed though to get a better understanding of the proposed mechanisms of floss band treatment. For more information or to give it a try ask one of your physiotherapists next time you see them! Bohlen, J., Arsenault, M., Deane, B., Miller, P., Guadagno, M., & Dobrosielski, D. A. (2014). Effects of applying floss bands on regional blood flow. International Journal of Exercise Science, Conference Proceedings, 9(2). Knee pain whilst cycling: Does your bike fit? Do you get an increase in pain at the front of your knee after a ride? Has your bike ever been fitted to your bodies dimensions? This blog gets a bit into the science of how cycling related knee pain is caused and what you can do to prevent it. The two primary causes of knee pain commonly seen in cycling by a physiotherapist are problems with muscle activation patterns and bike setup. Muscle activity of the lower limb during pedaling has been studied, with the onset and offset of EMG activity in relation to crank position during pedaling shown in the figure below (figure 1). This shows the activation of the gluteals (GMax) and quadriceps (VM, VL, RF) (known as the power muscles) initiating before top dead centre (TDC) which are then followed by the hamstrings (SM, BF) and calf (GM, GL, Sol) (known as the coordination muscles). The power phase continues until bottom dead centre (BDC). Mechanical efficiency during pedaling is somewhat reliant on the activation and coordination of all active leg muscles and is not simply the result of any single muscle in particular. Several studies have looked at seat height as a causative factor in predisposing the knee to injury. The correct seat height will allow effective recruitment of your glutes and calf muscles as well as unloading the overstretched hamstring and neural structures. Common bike setup measures are shown in figure 2 below. A lower seat height (often seen in recreational cyclists) has been shown to increase contact forces at the kneecap joint and will often be the most likely cause of pain. Seeing a sports physiotherapist can help identify if there are muscle weakness or activation problems and give you advice on how to correct these. This can lead to improved efficiency and reduction in pain. When treating cyclists with knee pain it is important to consider an optimal bike setup and riding position that is conducive to the ranges of the cyclist’s biomechanical limitations. This can not only minimise injury but also improve performance. There are many elements to setting up your bike that can be altered (seat height is just one!). So if you suffer from pains in other parts of your body whilst riding (back, neck, shoulders etc) discuss this with your physio who can perform a bike-fit assessment or refer you to someone that can. Asplund, C., & St Pierre, P. (2004). Knee pain and bicycling: fitting concepts for clinicians. The Physician and Sportsmedicine, 32(4), 23. Bailey, M. P., Maillardet, F. J., & Messenger, N. (2003). Kinematics of cycling in relation to anterior knee pain and patellar tendinitis. Journal of Sports Sciences, 21(8), 649. Bini, R., Hume, P., & Croft, J. (2011). Effects of Bicycle Saddle Height on Knee Injury Risk and Cycling Performance. Sports Medicine, 41(6), 463-476. Dettori, N. J., & Norvell, D. C. (2006). Non-Traumatic Bicycle Injuries. Sports Medicine, 36(1), 7-18. Hug, F., & Dorel, S. (2009). Electromyographic analysis of pedaling: A review. Journal of Electromyography and Kinesiology, 19(2), 182-198. Ward, S. R., Terk, M. R., & Powers, C. M. (2005). Influence of patella alta on knee extensor mechanics. Journal of Biomechanics, 38(12), 2415-2422. Wisbey-Roth, T., & Visentini, P. (2016). Optimising Biomechanics in Cycling (Course Notes). Not an entirely uncommon occurrence following a round of golf for many of us, but this does not have to be the case. Low back pain is generally considered to be the most common complaint by golfers. It has been reported that actual injuries to the low back occur in 11% of male golfers while the actual incidence of low back pain, in the same cohort, is 52% (Batt 1992). The Titleist Performance Institute (TPI) report that 28% of all players deal with low back pain after every round (TPI, 2015). Causes of low back injuries can vary and can include disc or facet irritation, stenosis with associated nerve impingement, degenerative joint disease and occasionally spondylosis (TPI, 2015). "28% of all players deal with low back pain after every round"
The movements of the golf swing (figure 1) are generally referred to in phases of backswing, early and late downswing and early and late follow through (McHardy and Pollard 2005). This large amplitude of movement involves rapid and forceful generation of power incorporating the hips/pelvis, trunk and upper limb transferring energy from the ground to the club resulting in considerable stress within the spine. These forces involve a downward compression, side to side (or lateral) bending and sliding (or back to front shearing) with the compressive loads at the 3rd and 4th lumbar vertebrae (L3/4) segment shown to peak at up to 8x body mass (Hosea et al 2010). Range of movement of the torso covers a large amplitude beginning in 30 degrees of forward flexion and by the end of the swing finishing in 30 degrees of extension (TPI, 2015). It is no wonder then that the discs that occupy the spaces between these vertebrae become vulnerable to damage. They also showed that in golfers WITHOUT low back pain there was increased trunk flexion velocity during the downswing, implicit that increasing abdominal muscle activation, strength and force production during this movement may possibly be a protective mechanism (Lindsay and Horton 2002). When does the player get pain (during or after a round of golf)? What is the nature and intensity of the pain? Past history of similar injuries? When performing a physical assessment, areas that should be addressed first are often the dysfunctional non-painful movements. In other words, these are movements that the golfer is simply unable to do. This can be an inability to fully squat or having increased stiffness with thoracic rotation (click here for more info about the role the thorax has to play). They tend to be the biggest problems diagnostically and are generally the cause, not the site, of pain. To discuss any of these issues or to have a golf specific screen get in touch to find out more. Lindsay, D., & Horton, J. (2002). Comparison of spine motion in elite golfers with and without low back pain. J Sports Sci, 20(8), 599-605. TPI (2015). Course notes Level 2 Medical and online lecture material, Titleist Performance Institute. Stress fractures commonly occur in sports where the movement demands of the sport produce repetitive loads on the body. Sports involving running, jumping and dancing place the individual at a higher risk of a bone stress injury. The incidence of stress fractures in the femur can range from 2.8% to 33% of all stress related injuries (both to the shaft and neck of femur). Management of these injuries requires an accurate diagnosis, often long periods of activity modification and rehabilitation (generally <4 months). The rehab program requires the close monitoring of a gradual and structured increase in load to allow the individual to return to full activity. A stress fracture can occur as the result of fatigue failure of bone where the amount of microscopic damage from repetitive load exceeds the bones ability to repair and remodel. The femoral neck is particularly vulnerable due to the fact that the majority of vertical compression forces load through the femoral head, falling medially to the shaft of the femur. This creates a compressive load medially and tension load laterally. A stress reaction, or fracture, occurs when there is a failure of the bone to remodel adequately with the addition of repetitive sub-threshold stress. This ability of bone to adapt to pressure, or lack of it, is known as Wolff’s Law and refers to the bones anisotrophic ability to manage load along multiple axes. Cortical bone, of which the majority of the skeletal system is comprised, is heavy and has a slow metabolic turnover which can increased the likelihood of stress related injuries. Especially when there is inadequate recovery time after exercise and loading. Mechanical load on the bone in the form of intrinsic loading (stress) or mechanical deformation (strain) is required for bone remodelling to occur. When a stress injury occurs the bone is unable to cope with the excess amount of stress or strain. Load on a bone can be classified as compressive, tensile or shear. When a bone bends it will experience a compressive load on one side and a tensile load on the contrary side. Usually a failure of bone integrity will occur on the tensile side. This can result in microscopic damage accumulating and fatigue failure of the bone occurring, described as “crack initiation” (Knaeding et al, 2005). Without adequate rest and recovery time, this process will continue towards a “crack propagation” which results in a macroscopic failure of the bone. Risk factors for developing stress fractures can broadly be categorised as intrinsic or extrinsic in nature. Delayed diagnosis has been shown to be associated with poorer outcomes in athletes. A study of 23 athletes with femoral neck stress fractures with follow up over 6 years following injury noted the most significant aspect of management was a delayed diagnosis with 13 athletes requiring internal fixation. The average time to confirming the diagnosis was 14 weeks after initial onset of symptoms. The injuries requiring fixation were career ending for all elite athletes in the study (Johansson et al, 1990). The most important determinant to be made with femoral neck injuries is the site of stress. Lateral femoral neck injuries are considered a high-risk stress fracture compared with medial sided compression stress. As a result, a slower, more cautious conservative rehab approach should be taken with a longer recovery time for lateral sided compression injuries. Management should be done in collaboration with a sports medicine physician who can address other possible intrinsic causes. Physiotherapy treatment is paramount as this will guide the athlete back to a sporting performance level. A guideline for time frames and loading is summarised in table 2. Evidence for return to activity with femoral neck stress fractures is poor, lacking any substantial randomised control trials, and limited only to expert opinion based articles and case series (Wang et al, 2015). General consensus shows that a minimum period of 4-6 weeks of strict non-weight-bearing must be carried out until pain free. This can then be upgraded to partial weight-bearing, weight-bearing as tolerated and then followed by full weight-bearing. Continual and regular assessment is important to ensure the pain does not return and that suitable loading and subsequent healing has occurred. Follow up radiographs can be done to ensure adequate healing without progression of a fracture line. Non-impact exercises can then be gradually introduced followed by low impact and finally running exercise is allowed. Progression through such loads is only allowed in the absence of pain. Regression of load is needed if pain returns. If you are a runner and have noticed a gradual increase in hip pain with running training, contact us at The Physio Lab for an opinion and discussion on what the possible causes might be and further management options to prevent a potentially serious injury from occurring. Stress can play a significant role in ischaemic muscle pain (a restriction in blood supply to muscle tissue) and/or neck pain. With this, the role of of breathing should be brought into the clinical equation. This is not only due to the proximity of the respiratory muscles to the thorax (rib cage) and neck, but also due to the connection breathing has with various emotional states in our lives. Think of how you hold your breath in reaction to shock or suspense or how your breathing is effected by anxiety or stress. When I see patients that present with neck pain I would usually sub-classify them, in my own terms, as either ‘pathological necks’ (those with symptomatic pathology such as boney, muscular or neural) or ‘stress necks’. Not the most accurate descriptions, and often not so clean cut, but this basically enables me to identify that a 'stress neck' will probably not respond as well to traditional manual therapy techniques and is usually better off with modalities such as dry needling, generalised upper body exercises, breath work and general advice on stress management. "Does a poor, weak, posture cause respiratory dysfunction?" When managing neck pain that is the result of stress, a focus on breathing and breath work exercises can have a two-fold effect. Firstly, it can mobilise the ischaemic muscles that are, at least in part, the result of a static cervicothoracic spine. Many cervical muscles have their origins on the thorax and are associated with respiration. The effects of breathing can therefore result in improvements in neck and thorax posture. Secondly, there is a resultant stress reduction due to an increase in mindfulness surrounding the pattern and rate of breathing. Breathing techniques that slow down the out breath can help stimulate the parasympathetic part of the nervous system which can reduce stress levels in the body. The respiratory system is involved in our bodies response to stress. Its role is to breathe faster to increase oxygen and blood circulation throughout the body. This system can be impaired by static postures - think of those hours sitting at the computer or in work meetings and the stiffness that occurs in the neck and upper back. The dysfunctional muscle patterns and poor breathing mechanics that result from these static postures will therefore be a contributory element in the way that the body reacts to stress and in its ability to bring the body back to a state of calm and rest. Dimitriadis, Kapreli, Strimpakos & Oldham (2016) recently reviewed the role a dysfunctional respiratory system can play in chronic neck pain. They extrapolated causality quite nicely in this model (figure 1) looking at the various mechanisms and manifestations of neck pain and how they relate to poor respiration. Interestingly they point out that drug use to manage pain can reduce respiratory drive, while on the other hand, noxious stimuli can increase respiration and alter rib cage mechanics. Both these changes lead to dysfunctional breathing patterns that can alter blood chemistry and result in hypocapnia (low carbon dioxide levels). This is often seen in patients with chronic neck pain. They do note that while changes are seen in respiratory function, they are not at a level that can be classified as pathological at this stage. More good quality trials are needed to better understand this relationship. The same group of researchers (Dimitriadis, Kapreli, Strimpakos & Oldham, 2013) also showed that patients with chronic neck pain (noted as having pain for a period of at least 6 months with weekly episodes) compared to healthy matched controls, showed significant reductions in maximal inspiratory and expiratory pressures most likely related to poor global and local muscle systems. This may raise a chicken and the egg dilemma: Does a poor, weak, posture cause respiratory dysfunction or is it the other way around? The link between stress and neck pain is very important. Posture also plays a significant role in neck pain. This is where I think that bridging these two areas is necessary. Attention to the role of breathing mechanics and respiratory rate within the context of good alignment of the spine, is something were we, as physiotherapists and educators, can have a big impact on patients with stress related chronic neck pain. For more information on physiotherapy management techniques of chronic neck pain please seek an opinion from your physio. Dimitriadis, Z., Kapreli, E., Strimpakos, N., and Oldham, J. (2016). Respiratory dysfunction in patients with chronic neck pain: What is the current evidence?, Journal of Bodywork and Movement Therapies, Article in press. Available online 8 February 2016. doi.org/10.1016/j.jbmt.2016.02.001.